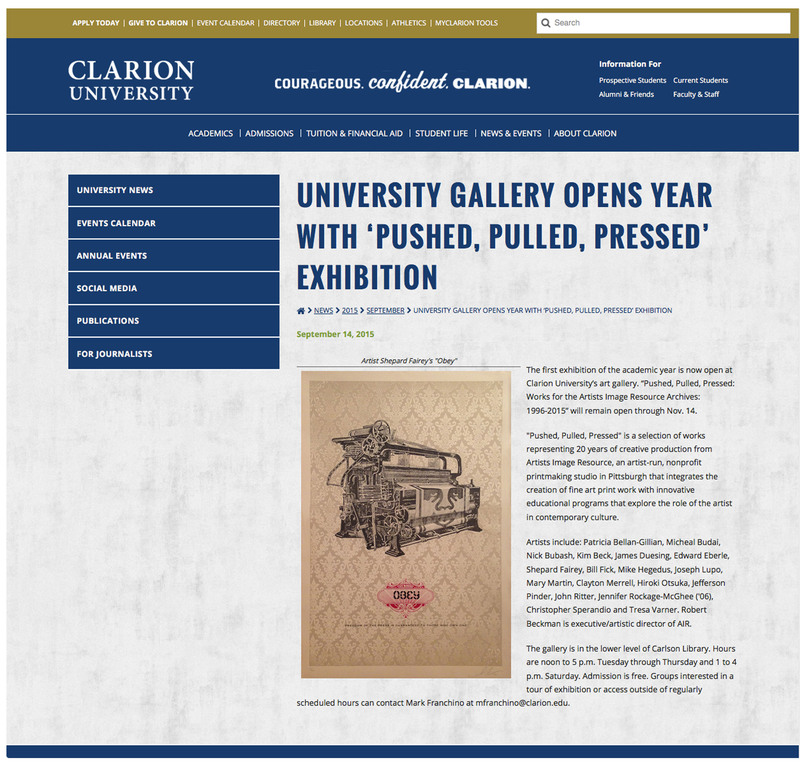 Recent work of mine will be on display in the “Pushed, Pulled, Pressed: Works for the Artists Image Resource Archives: 1996-2015” exhibition at the Clarion University Art Gallery in Clarion, PA.
“Pushed, Pulled, Pressed” is a selection of works representing 20 years of creative production from Artists Image Resource, an artist-run, nonprofit printmaking studio in Pittsburgh that integrates the creation of fine art print work with innovative educational programs that explore the role of the artist in contemporary culture. Artists include: Patricia Bellan-Gillian, Micheal Budai, Nick Bubash, Kim Beck, James Duesing, Edward Eberle, Shepard Fairey, Bill Fick, Mike Hegedus, Joseph Lupo, Mary Martin, Clayton Merrell, Hiroki Otsuka, Jefferson Pinder, John Ritter, Jennifer Rockage-McGhee (’06), Christopher Sperandio and Tresa Varner. Robert Beckman is executive/artistic director of AIR.